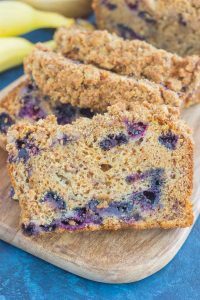 This Cinnamon Streusel Blueberry Banana Bread is packed with the classic banana bread flavor, loaded with juicy blueberries, and topped with a sweet and crumbly cinnamon streusel. 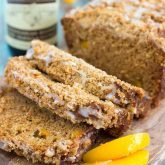 Soft, moist, and perfectly delicious, this quick bread makes the best breakfast or dessert! It’s 2018…wow does that look weird in writing! It also feels even weirder to say. I hope you all had a joyous holiday season and rang in the new year with loved ones. I know I did! After taking the last week or so off from blogging (for the most part, anyways), I’m ready to start the new year off with a bang! 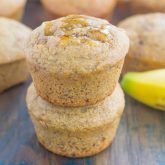 It’s become an unofficial tradition around here to share with you a muffin recipe for the first recipe of the new year. 2015 brought these Double Chocolate Chunk Muffins; these Banana Chocolate Chip Muffins were the star of the first recipe of 2016; and these Bakery Style Blueberry Muffins rang in 2017. Now, I guess you could say that I’m breaking tradition, since I’m sharing with you a favorite quick bread of mine, but, I thought it would be nice to start 2018 with a deliciously sweet treat, that’s very similar to a muffin. And I think you agree, right? If you’ve been hanging around here long enough, you know that I’m all about banana bread. From this Banana Bread Granola, to that Banana Bread Smoothie, those Banana Bread Scones, and this Baked Banana Bread Oatmeal, I love it all. So, it only seemed natural that I take my classic banana bread recipe and jazz it up a bit. Blueberry and banana make the most delicious combination, especially when cinnamon streusel is involved. It’s moist, packed with flavor, and just captures the flavors of the fruits perfectly. 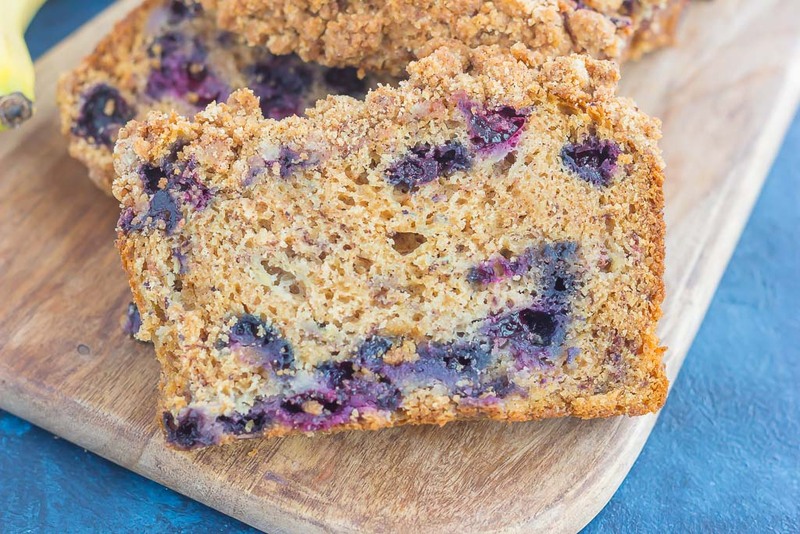 This Cinnamon Streusel Blueberry Banana Bread is my favorite quick bread to date. As soon as I smelled it baking in the oven, I knew I had a winner. The texture, the flavor, and that sweet, cinnamon-y, brown sugary streusel adds the most perfect crunch of sweetness. I mean, just look at that crumble on top! If you’re a lover of banana bread, I guarantee this is the only recipe that you’ll need from here on out. Like most of my baked goods, I added in some Greek yogurt to keep the bread extra moist, without sacrificing flavor. And did I mention the cinnamon streusel? If you haven’t tried it on top of banana bread before, you’re totally missing out. Trust me…it’s a game-changer! 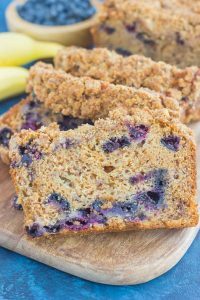 So, grab those blueberries and bananas and whip up this easy Cinnamon Streusel Blueberry Banana Bread. One bite and you’ll be hooked on the texture, flavor, and all-around deliciousness! Looking for more quick bread recipes? I’ve got you covered! Preheat oven to 350F. Lightly grease a 9x5 loaf pan with non-stick cooking spray. Set aside. In a medium bowl, combine the flour, baking powder, baking soda, cinnamon, and salt. Set aside. 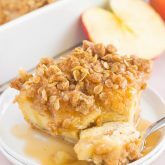 In a large bowl, cream butter, white sugar, and brown sugar with an electric hand mixer or stand mixer with fitted paddle attachment until light and fluffy, about 2-3 minutes. Add eggs, one at a time, and beat well after each addition. Add vanilla extract and Greek yogurt. Beat well. Slowly add in flour mixture and beat until just combined. Gently fold in mashed bananas and blueberries. Pour batter into prepared pan. Set aside. To make the cinnamon streusel, in a small bowl, combine the brown sugar, white sugar, cinnamon, butter, and flour until thoroughly mixed. Sprinkle over top of batter. Bake for 55-65 minutes, or until toothpick inserted in center of bread comes out clean. Remove from oven and let cool in pan for 10 minutes, then remove to a wire rack and let cool completely. Happy New Year Gayle! This bread looks amazing! Love the video! Pinning to try it! Thank you, friend! Happy New Year to you, too! Streusel is definitely the best! Happy New Year, Gayle! I can't believe it's 2018! 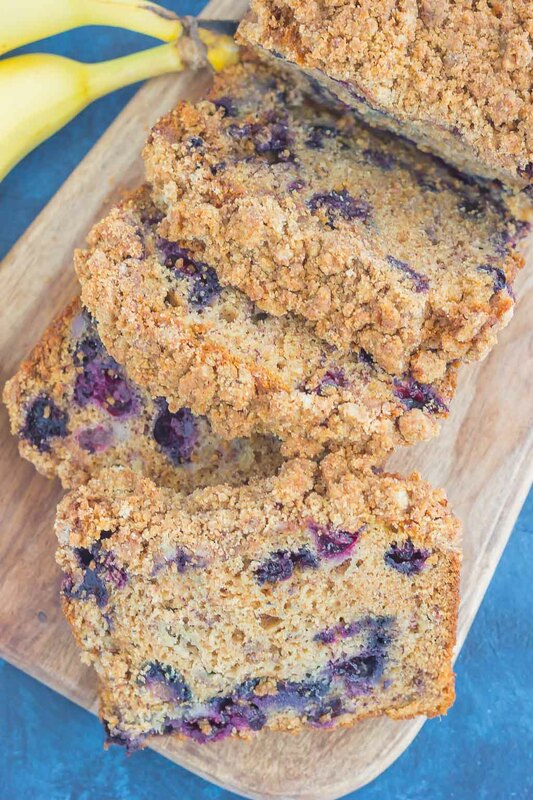 This blueberry banana bread looks like the perfect way to kick off the new year. 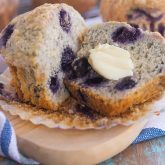 I love banana bread and I'm sure the blueberries take it to the next level! Thanks for the sweet comment, Keri! Happy New Year to you! This would be a yummy way to start the day with a cup of tea. Happy New Year. Sounds like a plan to me! Happy New Year to you, too! Happy New Year Gayle! I love your tradition to kick off the new year with a muffin recipe (and quick bread is close enough)! 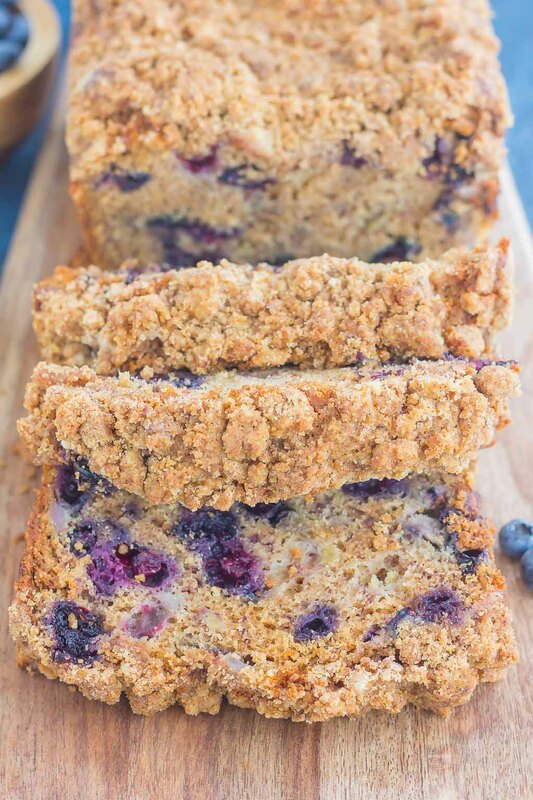 :) The only thing better than banana bread is when blueberries are added...and a streusel topping just takes pushes it over the top. I need this for breakfast soon! Thank you, Marcie! I agree, the blueberries are such a fun and tasty addition, especially with streusel! Happy new year Gayle, the bread looks delicious! Best way to start your day! Thanks, Manali! Happy new year to you, too! I'd say a gorgeous quick bread like this is THE perfect way to start off the new year! Love love that cinnamon streusel, Gayle! Happy New Year Gayle!!! Banana bread is a favorite at our house and seems like a most excellent way to kick off the new year!! This sounds delicious! Oh man, I'm legit drooling all over my keyboard as I type this comment. I haven't had banana bread in what feels like forever and your recipe looks incredible! I'm kicking refined sugar this month but I'm allllll over this tasty baby next month for sure! Pinning!